If the first half of your 2014 was anything like it was here at MINES, it was jam-packed with exciting changes and new prospects. But don’t worry if the year has not been as busy as you’d prefer since we still have nearly half a year of opportunity before 2015. So take a deep breath, relax, and continue to strive for balance and wellbeing in your life as we tackle Q3 together; but before we go forward, let’s look backwards for a moment. As usual, “Bridging the Gap” aims to take everything MINES has been going on about for the last quarter and break down the topics and the connections that they have with one another, as well as your life and the lives of those around you, to make sure that the information we share can have the best possible impact on your view of wellbeing, and bring balance into your life every day. The second quarter of 2014 saw MINES introduce a whole host of new resources, inspirational stories, and wellbeing topics. Let’s start with the wellbeing topics first. In April, we introduced all new wellbeing topics: intellectual and social wellbeing. While exploring these topics we looked at the importance of being mindful of the influence that your friends, family, and society in general have on your cognitive processes. Next, in May we continued our examination of intellectual wellbeing, this time looking at its connection with financial wellbeing. We looked at the complex implications these two topics have on each other on the individual as well as societal levels.Then in June, financial wellbeing carried over and was analyzed alongside social wellbeing. We looked at social circles and our financial statuses effect on one another as we interact in our social lives. Finally, earlier this month we linked physical wellbeing with a completely fresh topic, environmental wellbeing, prompting a look at our physical self and its place in the world around us. As our readers have come to expect from our blog, last quarter was filled with a wide array of diverse content from all corners of the MINES Team. Dr. Robert Mines chimed in with posts on Overcoming Adversity, Compassion, and the Psychology of Diabetes. Marcia Kent’s ever-inspirational “reFrame” covered hikes up Mt. Kilimanjaro and how to get the most out of all 1,440 seconds in a day. One of our case managers, Heather DeKeyser, also contributed with a compelling look at resilience and its role in our lives as both an internal resource as well as a trait we look for in others to help guide us. MINES has a whole assortment of thought-provoking, and inspirational content headed your way over the next few months. There are plenty more topics in the pipeline and connections to be made. On our blog you can look forward to many new stories and ideas starting right away with members of our BizPsych team taking a multi-angled look at questions and trends they see while training organizations on generational differences, with much more to come from the rest of MINES. Whew! That’s about it for now but if you have questions or comments about this or anything else MINES is up to please let us know, we would love to hear from you. You can comment on our posts here or don’t forget to email us and let us know what is on your mind. See you next time! 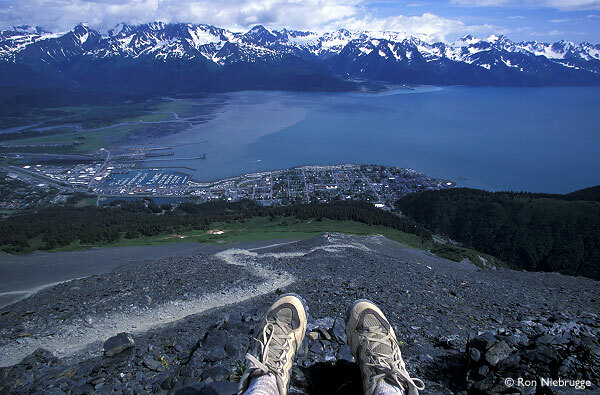 The Mount Marathon event, an athletically dazzling feat of speed and agility held on Mount Marathon in Seward, Alaska, captured my imagination when I heard a story about it on NPR on my way home from work. Melissa Block was interviewing Christy Marvin, a mother of three young children, who was the winner in the women’s division last year. Legend has it that the event started as a bet between two sailors. Race 3,022 feet to the top of Mount Marathon and back down in an hour. The first attempt in 1908 was a failure. Today, hundreds do whatever it takes to survive the challenge of the summiting and returning from the Mount. 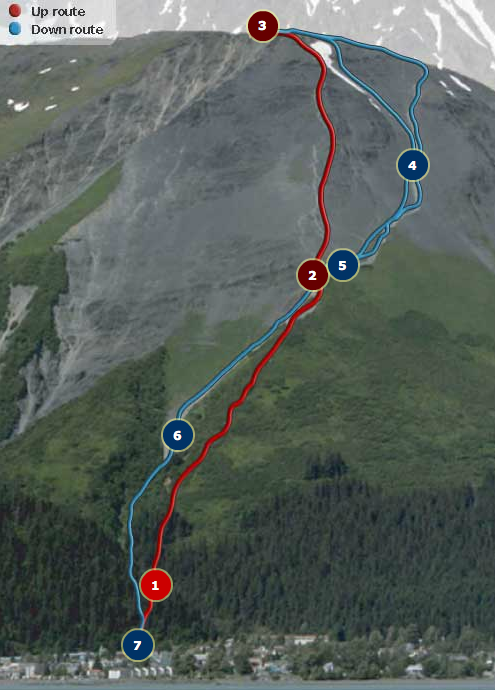 Leading racers will typically reach the peak in 33–40 minutes and reach the finish line from the peak down in 10–15 minutes. Average speed uphill is 2 mph. Average speed downhill is 12 mph. It is not uncommon for the racers crossing the finish line to be injured or bleeding and covered in mud. Melissa asked Christy a number of questions including the universal question, “Why, in the world would anyone want to do something like this?” Runners have fallen off cliffs, broken multiple bones and a few have perished, never to be found. Christy described how being in the mountains connects her to her values, the thrill of the adventure and the satisfaction of preparing for the run. Melissa asked her how she trains for this event given that she has three young children. Christy shared that she would often bring her children along when she would train. She talked about the various training techniques including “hill training” which involves repeated runs up and down the same hill. Inspiration, encouragement and support can sometimes come from the most unlikely of places. We all have our versions of a Mount Marathon; An epic project, a problematic situation at home, a challenging colleague or an unreasonable and demanding client that seems impossible to please. Here’s to you having the confidence, healthy mindset and inner strength to be able to “dig” when you need to! “Poley, Poley, Sippy, Sippy.” That’s what you hear from your porters when you climb Mount Kilimanjaro. It’s a mantra on the mountain. Translated it means, “slowly, slowly, sip, sip”, as a reminder to go slow, take one step at a time, take a sip of water and stay hydrated. If you’ve ever set out to accomplish a goal, you know the importance of having a plan (a map with the route), having the resources (guides, food, and water), the determination (I WILL get to the top), resilience, and a positive attitude. All of those elements still come down to one step at a time and ultimately appreciating that the cumulative effect taking one step at a time leads you to some incredible places and experiences. 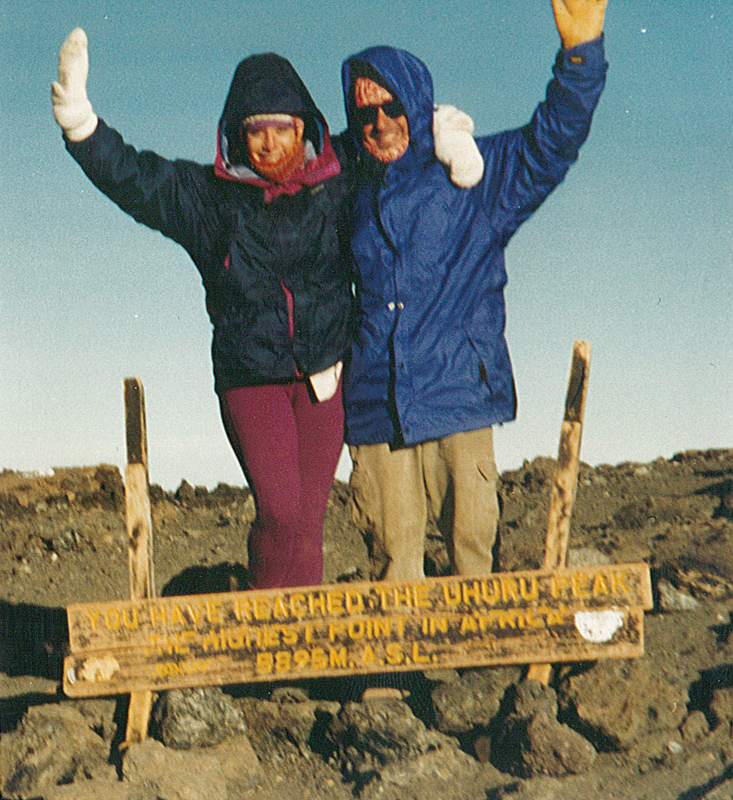 I climbed Mount Kilimanjaro in 1994 and it was one of the highlights of my time in Africa. I had just recovered from a very serious bout with falciparum malaria that manifested itself in the Himalayas of Nepal. I was evacuated out by helicopter from the Nepalese army and brought back to Kathmandu. From there I had to return to the United States to work with tropical infectious disease specialists and recover while my traveling companion stayed on and traveled solo. Something stirred deep inside when I heard he was going to climb Mount Kilimanjaro. All of a sudden, I heard myself say, “Well, if you’re going to climb Mt. Kilimanjaro, then I’m going to climb Mt. Kilimanjaro”. A month later I got off the plane in Tanzania and we began putting our plan in place: meeting with guide companies, shopping for supplies, applying for the visa, and taking day trips to build our endurance for the climb ahead. I hadn’t thought much about this adventure until a few weeks ago when I attended the International ASTD conference in Washington D.C. One of the breakout sessions I attended was called “Olympic Leadership” by Susan Goldsworthy, a former Olympic swimmer. I was captivated by the description which promised to share a model for reaching goals. To my surprise, she talked about her experience climbing Mt. 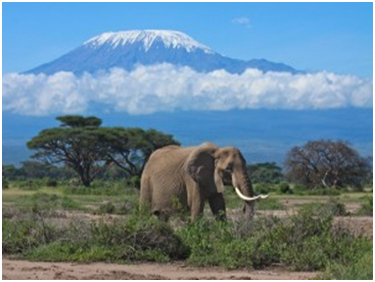 Kilimanjaro and what an “Olympic” size challenge it was for her. It turned out, she was deathly afraid of heights! Wouldn’t you know it, there is a spot on the trail where you have to go around “hugging rock”. It’s called “hugging rock” because the only way around is to hug the rock while you make your way around a narrow trail with a very steep and very long drop off if you misstep. She shared her “5D Framework” model for goal setting: Disruption, Desire, Discipline, Determination, and Development. Her “disruption” was turning 40 and she had the desire to push through her fear of heights. She was disciplined in her training and absolutely determined to make it to the top. Her development involved looking at some of her limiting beliefs, challenging some of her assumptions, and taking that practice of “poley, poley, sippy, sippy”, and applying it in other areas of her life. For me, the disruption was coming down with a serious illness. My desire was to join my traveling companion and have a shared experience. I exercised discipline with my choices on the way to a healthy recovery. I was determined to make it to the top even when I started exhibiting symptoms of hypothermia. My development has also been about the importance of being able to take one step at a time and trust that it will take me to where I want to go! Another development for me was to embrace my curiosity about what the landscape looks like from a different perspective. I’ve continued to embrace that curiosity be it in my travels, relationships, or professional endeavors. I invite you to look at the areas in your life where taking the “poley, poley, sippy, sippy” approach will serve you well. I’m always happy to confer and think out loud about where this approach can be useful and how to embrace an action plan that is all about one step at a time! Here’s to getting to the top and enjoying the view! It’s the number of minutes we have each day. Today, I attended the 7th Annual Colorado Culture of Health Conference. One of the keynote speakers was Dr. Wendy Lynch, who was recently named in Forbes “One of Thirteen to Watch in 2013: Unsung Heroes Changing Healthcare Forever,” Her message about the balance of work and wellbeing was compelling. The presentation focused on human capital and human capital currency. She defined human capital as a set of assets that we all have; our skills, health and motivation. No one can make us increase our skills, become healthier or more motivated without our own involvement. We own our assets! Think about a time when you made a change in your health, learned a new skill or searched for a source of motivation. You might have had encouragement, been given a compelling reason to make an adjustment or an ultimatum to make a drastic change. In the end, it was your choosing and your doing. You are the owner of your assets when it comes to your health, skills and motivation. Human capital currency is our energy, attention and time. We share that currency when we contribute at work, participate at home and engage in recreational pursuits. We spend our currency because we believe that we will get something in exchange. Typically, we do something because it creates value: a satisfying experience, an intrinsic reward, an extrinsic affirmation or a monetary gain. 50% of Americans feel the biggest thing lacking in their lives is time – not money. During the week, only 47% of all calories are consumed while “only eating” is our sole activity. The other 53% are consumed while we’re multi-tasking. 4 out of 5 smart phone owners check their phones within the first 15 minutes of waking up! Adults, 18-64 years of age, only do 17 minutes of fitness activities per day. Of Americans 25 years of age and older, 6.6% engage in health-related self-care each day. Did these statistics get your attention? They got mine. I had to ask myself if I was spending my 1440 wisely. Not an easy question. If I’m being truthful with myself, my answer varies from an unequivocal “yes” to a resounding “no”. Time is a fixed resource, constrained and finite. It’s not something I want to squander away or waste. When I engage in activities that are aligned with my values, I know I’m spending my currency wisely! My sense of well being improves; I get motivated to take action and can feel myself thrive. For this month, I invite you to be healthy, be well and thrive. Be sure to spend a part of your 1440 currency engaging in activities that lift the heart and engage the spirit! And, if you’re interested in how to bring balance and wellbeing into your workplace, give me a call!